Deep under the surface of the sea, conditions are hard to live in. Food is scarce due to lack of sun, thus lack of photosynthesis, and thus organisms survive on scraps that sink down from above. Some deep-sea fish are able to emit light from parts of their body. For example, the angler fish has a rod-shaped spine sticking out of its face which gives out light. The light attracts prey which the angler fish then eats. Deep-sea fish often have huge mouths e.g. the rat-tail fish which moves along the seabed scoops up particles of food. Many deep-sea fish have huge eyes adapted to the dark and long feelers to help their way around. There are volcanic/hydrothermal vents in the seabed that send out hot water and minerals into the cold ocean. Some organisms have adapted to living around them. The chemicals from the vents support bacteria that are able to make their own food, using chemical energy. This is called chemosynthesis. It’s a bit like photosynthesis, but it uses chemical energy instead of light energy. The bacteria are at the bottom of the food web and are the producers. Bacteria which live near the vents have to be specially adapted to cope with the high temperature and pressure. Deep sea Pompeii worms are covered with a thick layer of bacteria which helps to protect it from the heat. As it lives at depths of over 2km its body is adapted to pressures over 200 times those at sea level. A compact shape which gives them a small surface area compared to volume which reduces heat loss. A thick layer of blubber for insulation which also acts as an energy store for when food is scarce. Thick hairy coats to trap a layer of warm air next to the skin, and their greasy fur shed water (this prevents cooling due to evaporation). Big feet which help by spreading their weight. This stops them from sinking into the snow or breaking thin ice. Polar bears have white fur to match their surroundings which acts a camouflage. Have similar adaptions to polar bears such as the thick layer of insulating fat and oily feathers. Huddle together in groups to conserve heat. Have a streamlined body to reduce water resistance – so they can swim fast and catch fish. Animals – humans can be a mass within a range. Microorganisms – the width of coli bacteria varies within a range. Plants – e.g. a tree can have any number of leaves within a range. A graph of continuous variation is an example of a normal distribution curve. Most people would be around the mean height and fewer people would be at the extremes. 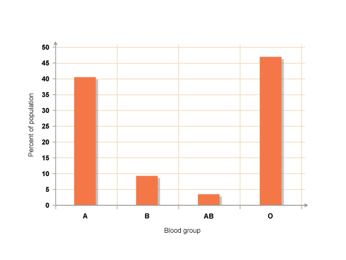 Animals – humans can be only one blood group (see graph below). Microorganisms e.g. bacteria are either antibiotic resistant or not. Plants – the colour of a courgette is either yellow, dark green or light green.